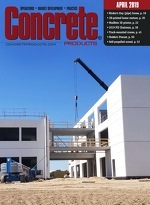 Nox-Crete Products Group introduced two concrete form release agent sprayers last month at the 2013 Precast/Prestressed Concrete Institute Convention in Dallas. The Ultimate Concrete Form Sprayer and the Excel 130 Concrete Form Sprayer are specifically designed for precast applications where tighter control of release agent application is necessary to ensure maximum performance and economy. The Ultimate Concrete Form Sprayer is a wheeled cart model with a 150-psi (10 bar), 10-gal. (38l) compressed air tank powering a 5-gal. (19l) product container with a 100-ft. (30m) extended hose. The carted sprayer has a robust steel frame and solid wheels, but can also fit though narrow spaces. The Ultimate Concrete Form Sprayer features quick-connect valves for easy product tank change out and a high-capacity Banjo liquid filter to prevent clogging and wasted time cleaning out filter. The long hose suits large area applications like precast bridge girder forms and double tee beds. application. To minimize leaking and maintain uniform application, the Excel 130 features a spray gun style handle with a drip-free trigger valve.